Since the creation of a Social Innovation and Social Finance Strategy for Canada was included in the 2015 Ministerial mandate letters, the federal government has taken steps to develop a strategy, culminating in the release last August of the recommendations of the Co-Creation Steering Group for a Social Innovation and Social Finance Strategy for Canada. Support innovative solutions on a broad range of social challenges through a competitive, transparent and merit-based process. Attract new private sector investment to the social finance sector. It is expected that the Fund would achieve matching funding from other investors. Share both risks and rewards with private investors on any investments. Only support investments that are not yet viable in the commercial market. Help create a self-sustaining social finance market over time that would not require ongoing government support. $50M over two years for an Investment and Readiness stream, for social purpose organizations to improve their ability to successfully participate in the social finance market. The creation of a permanent Advisory Committee on the Charitable Sector, led by the Canada Revenue Agency, and made up of stakeholders from the charitable sector, which will provide advice to the Government on important issues facing charities on an ongoing basis. Details on the governance and parameters of the Social Finance Fund will be developed further in the coming months and released in early 2019. In addition to these measures, the Government committed to working on other recommendations from the Steering Group’s report. 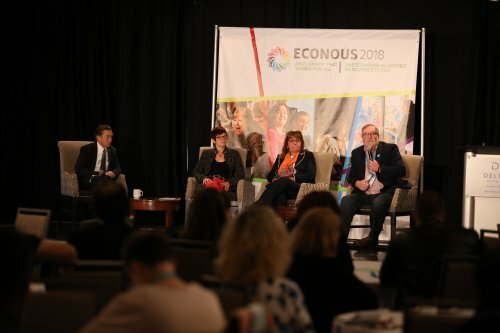 CCEDNet congratulates Minister Jean-Yves Duclos, Minister Patty Hajdu, the sector leaders who crafted the Co-Creation Steering Group’s report, and Employment and Social Development Canada officials who contributed to this historic advance. This entry was posted in Community services, First Mile, FMCC, National, News. Bookmark the permalink.